Can I read your palm? Here are some really corny chat-up lines for you to learn and use… if you’re feeling brave. Great news! 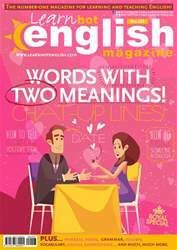 The latest issue of Hot English (203) is out now! Learn over 1,000 useful words and expressions and improve your listening skills with Learn Hot English! This month: learn about some words with more than one meaning. Plus, 10 expressions, 10 useful words for talking about the bathroom, idioms, phrasal verbs... plus: • Jokes – jokes in English. • Monarchy – some interesting gossip. • Grammar – passives with “have”. • Driving – number plates. • Functional language – persuasion. • Humour – award ceremonies that go wrong. • History – crazy rulers. • Actors – Colin Firth. • Romance – chat-up lines. • Culture – museums from around the world. • Psychology – noise. • Language – clichés. AND LOTS, LOTS MORE! By reading and listening to all this great content, you'll improve your English reading and listening skills and learn up to 1,000 useful words or expressions. Plus, you'll get a better job and pass English-language exams more easily. Guaranteed! Car number plates. What's yours? WORDS WITH MORE THAN ONE MEANING! CHAT-UP LINES WITH DOUBLE MEANINGS!